Three Vintage Style Bulbs in Glass Dome Table Lamp. 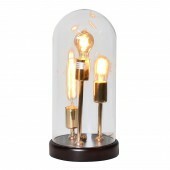 Includes 3 vintage filament bulbs which can also be mixed and matched with different shape, size and even watt bulbs. Switch is on flex cable.